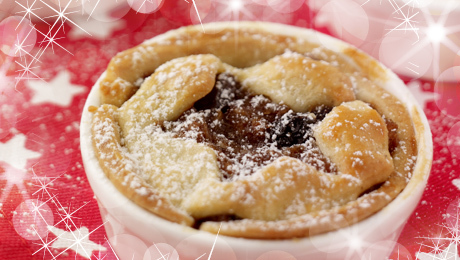 Use the Homemade Rich Mincemeat recipe to make these delicious pies. Put all the ingredients into a mixer and mix until bound together. Wrap in cling film and allow to rest. Preheat the oven to 180°C/350°F/Gas Mark 4 and grease and line your muffin tray or ramekins. Cut out discs of pastry and use them to line a 12-cup muffin tray or ramekins. Spoon some of the mincemeat into each of the pastry lined cups and then top with an additional layer of pastry. Use pastry cutters to make some star shapes for a more festive look. Bake for 15-18 minutes and serve with some freshly whipped cream with the addition of Irish whiskey.